Fig. 3. Spatial and frequency specificity of the alpha-band signal. (A) Scalp topography of absolute alpha power 400 ms before target onset, with electrode Pz indicated. (B) FFT of the pretarget data, indicating a peak in power at 10.6 Hz. Credit: Samaha J et al. (2015) Top-down control of the phase of alpha-band oscillations as a mechanism for temporal prediction. Proc Natl Acad Sci USA 112(27):8439-8444. Standard models of perception are stimulus-driven, meaning that the external perceptual event drives the brain's perception-related activity. However, the tide may be turning: recent ideas suggest that our perceptual experiences and visually guided behaviors are influenced by top-down processes in the brain – specifically, the brain's predictions about the external world. Recently, scientists at University of Wisconsin–Madison demonstrated that perceptual expectations about when a stimulus will appear are instantiated in the brain by optimally configuring prestimulus alpha-band oscillations in order to optimize the effectiveness of subsequent neural processing. 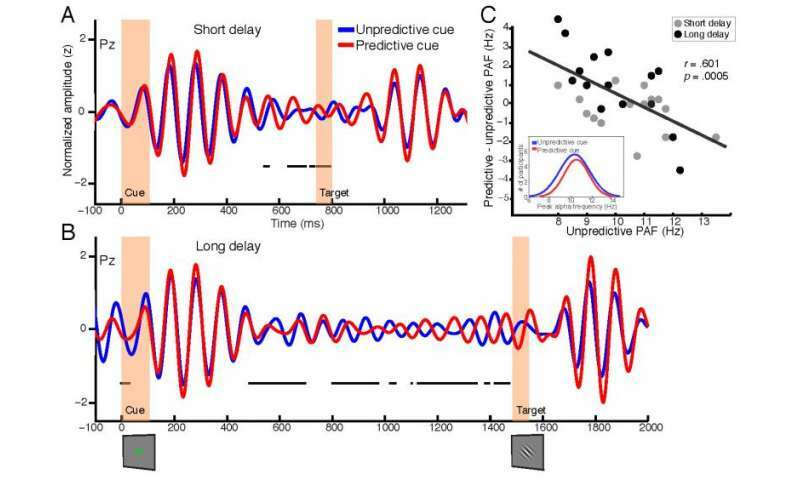 The researchers state that their findings provide direct evidence that forming temporal predictions about when a stimulus will appear can bias the phase of ongoing alpha-band oscillations (one of the dominant oscillations in the human brain) toward an optimal phase for visual processing, and so may be the means for the top-down control of visual processing guided by temporal predictions. Doctoral candidate Jason Samaha discusses the paper that he and his colleagues published in Proceedings of the National Academy of Sciences, first addressing what was involved in providing evidence that perceptual expectations about when a stimulus will appear are instantiated in the brain by optimally configuring prestimulus alpha-band oscillations to optimize subsequent processing efficacy. 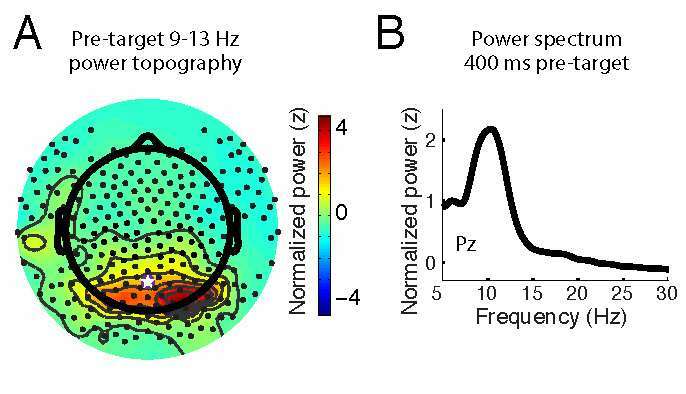 "Alpha-band oscillations have been studied for a long time, especially recently in the context of visual attention," Samaha tells Medical Xpress. "Because neural oscillations have many potentially relevant features – that is, neural processing may be related to the amplitude or phase or frequency of these oscillations as well as the way that they interact – a major challenge remains in delineating which properties of these oscillations are relevant and why." In this study, he notes, the scientists focused on a single but important physiological signal: the alpha-band oscillation phase (peak or trough) at a critical point in time. 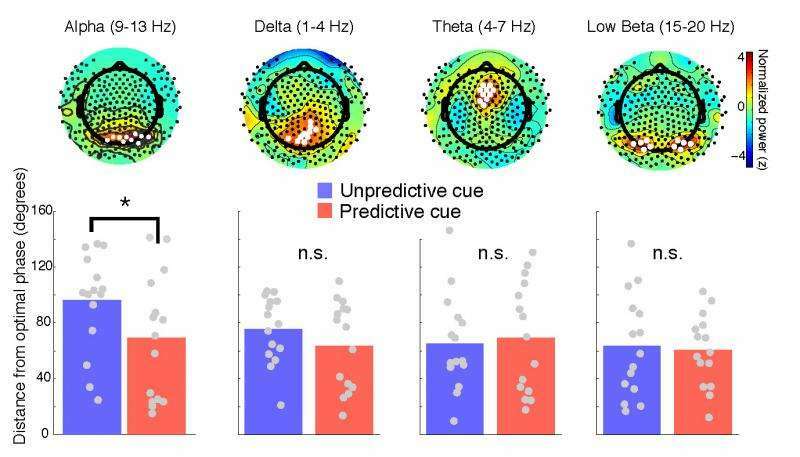 The paper also describes the researchers' investigation of whether the alpha-band phase can be guided by top-down control in a temporal cueing task as a mechanism through which perceptual predictions can optimally configure prestimulus neural activity. "Since oscillations necessarily unfold over time, they've been argued to provide intrinsic timescales for coordinated neural processing. Moreover," Samaha continues, "events in the world often follow a predictable time course, such as predicting when a thrown baseball will land in the glove of the catcher. We wanted to understand whether these types of temporal expectations improve the way that the visual system processes expected events – and if so, whether this was accomplished by adjusting the brains intrinsic oscillatory time scale in anticipation of the expected event." To accomplish this, the scientists had to design a task that could both induce these kinds of expectations and measure their effect on visual perception. A key issue in designing said task was testing if cueing human observers to the time at which a target visual stimulus would appear would bias the phase of ongoing alpha-band oscillations toward an optimal phase for visual discrimination. "A range of interesting findings has recently come to light suggesting that visual perception may be physically modulated, in that our perception of the same stimulus may change depending on if that stimulus occurs at the peak or the trough of our alpha oscillations," Samaha points out. "Our findings suggest that temporal expectations may change the timing of these oscillations such that visual events that are expected in time can land at the optimal phase of the alpha rhythm." To pinpoint this effect, the researchers first had to establish that the participants in their studies had an optimal alpha phase, meaning that they had to replicate previous findings. "We could then ask whether telling people when a visual stimulus would occur could push them towards their best phase at the predicted moment of the visual stimulus." Fig. 4. Temporal cueing modulates alpha-band phase. Each trace represents the normalized grand-averaged, alpha-filtered, event-related potential at electrode Pz for short-delay (A) and long-delay (B) trials, and for predictive (red) and unpredictive (blue) cue trials. Black squares indicate samples where phase significantly differed between the two cue types after correction for multiple comparisons. Temporal cueing led to phase differences before target onset for both long and short delays. (C) Prestimulus PAF on unpredictive cue trials predicts change in PAF following predictive cues. PAF was derived from an FFT of the data from 400 ms before target onset for long (black points) or short (gray points) delays. Although the group PAF did not differ significantly as a function of cue condition, the data varied systematically at the individual level in that predictive cues speeded up the alpha frequency of individuals with slower rhythms and slowed down the frequency of individuals with faster rhythms. This result suggests that following predictive cues, alpha oscillations converge on an ideal frequency such that the phase of the oscillation is altered by target onset. (Inset) This pattern is also evident as reduction of variance in the Gaussian-fitted histograms of PAF. Credit: Samaha J et al. (2015) Top-down control of the phase of alpha-band oscillations as a mechanism for temporal prediction. Proc Natl Acad Sci USA 112(27):8439-8444. The team conducted two experiments to make these determinations. The first established that cues predictive of the moment of target appearance significantly enhanced orientation discrimination and subjective visibility. "It's been a fairly recent discovery that establishing expectations, either about when a visual event will occur or what that visual event will be, can actually change the way that visual event is processing at early stages of the visual system," Samaha explains. "In the case of temporal expectations we have known for some time that an individual would be quicker to respond to an expected event, but this does not mean that temporal expectations enhance perception, per se. Therefore, we used a demanding visual task while measuring perceptual accuracy as well as participant's subjective reports to determine that temporal expectations actually affect the way that people see a stimulus." In their second experiment, the scientists found that temporal predictions led to a bias in the phase of ongoing alpha-band oscillations toward each participant's optimal phase for visual discrimination by replicating the first experiment's behavioral effect while concurrently performing an electroencephalogram (EEG) – a recording of the brain's electrical activity that measures voltage fluctuations resulting from ionic current within neurons. "To describe complex neural signals that evolve over time requires some novel analytic methods," Samaha recounts. 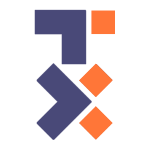 "In particular, phase is a nonlinear variable, and tools for analyzing it are constantly being developed in neuroscience. By applying circular statistics to our neural data, we were able to observe that temporal expectations can alter the phase of neural oscillations so that, at the expected moment in time, the oscillation will be at a specific phase angle that is optimal for visual processing." Unlike classical statistics, which work only with linear variables, circular statistics is designed to work with nonlinear variables – in this case, data points in the recurrent periodicity of alpha-band oscillations. Interestingly, the study's results touch on two theoretical domains that are currently in flux – namely, temporal prediction vs. temporal attention. "There have been recent suggestions that attention and prediction are not the same," Samaha tells Medical Xpress. "If I know when something will happen, it could be said that I can predict when it will happen – but if I don't need to do anything in response to that event, then I may not really be paying attention to it. In our experiments, stimuli were both predictable and attended, so it remains an open question for future research whether the effects we observed would disappear if attention was not allocated to the stimulus." Fig. S2. We reconducted our main analysis (testing whether predictive cueing biases alpha phase at target onset toward an optimal phase for stimulus detection; Fig. 5), this time using an empirically defined cluster of electrodes based on the topography of maximal alpha power. We averaged the alpha-filtered signal from the 10 spatially contiguous electrodes where alpha power was maximal at the group level during the 400 ms before target onset (collapsing across all trial types). We then tested whether predictive cue trials were closer to an optimal phase compared with unpredictive cue trials using the same procedure described in the main text (by computing the circular distance between the phase angle at target onset for catch trials and the mean phase angle of correct trials for each condition). Corroborating the original analysis, an ANOVA revealed a significant main effect of cue type [F(1,14) = 8.86, *P = 0.01], suggesting that at this cluster level, predictive cues led to a bias in the alpha-phase angle at target onset toward individuals’ optimal phase angle. (Upper) We applied the same analysis to identify clusters of 10 electrodes showing maximal power for delta, theta, and low beta bands during the pretarget window (400 ms before target onset). (Lower) Using the averaged response from these channel clusters, we still found no evidence of phase angle differences at target onset between correct and incorrect trials (all P > 0.2), and, importantly, no evidence for a bias toward the best phase (i.e., the mean phase angle on correct trials) following predictive cues, except in the alpha band. This finding suggests that the effects of temporal cuing on the phase of ongoing neural oscillations may be specific to the alpha band in our task. n.s., not significant. Credit: Samaha J et al. (2015) Top-down control of the phase of alpha-band oscillations as a mechanism for temporal prediction. Proc Natl Acad Sci USA 112(27):8439-8444. Relatedly, Samaha notes that independence of attention and consciousness is an important question for psychology and neuroscience in understanding how aware we are of events in our environment that may cause our behavior. "When we pay very close attention to a complex stimulus, we sometimes feel like we are aware of more than we can actually discriminate behaviorally. The opposite is true in some cases, where we do not recall seeing something but it nevertheless predicts our behavior later on. These findings suggest that our attention can sometime change our behavior without our ability to consciously introspect on those changes. In our experiments, we measured people's ability to behaviorally discriminate stimuli and we also measured their subjective reports about those stimuli – if they thought they saw them or not. We did this in case the two measures would dissociate from each other, but we actually found that they tracked each other pretty well – that is, temporal expectations improved individual's discrimination, and it also increased the frequency of their subjective reports of having consciously seen the stimulus. It therefore remains another question for future research as to whether temporal expectations and attention can differentially impact consciousness and behavioral responses." In terms of ongoing research, an interesting implication of their results is that visual perception may occur in discreet processing windows, clocked by alpha oscillations, rather than in a continuous stream. "We're currently testing these ideas and relating them to theories of consciousness," he tells Medical Xpress. As discussed above, they're also interested in exploring the independence of attention and consciousness – that is, to determine if independently manipulating stimulus visibility, temporal attention, and temporal prediction reveals another dimension along which consciousness dissociates from other high-level cognitive processes. "Another important step in this line of research is to understand the source of control of these processes: While we've shown that expectations can change the state of perceptual systems prior to the expected stimulus, we don't yet have a full account of how those changes are being implemented by higher-level systems that may encode goals and expectations." Samaha notes that there may well be translational applications their study. "A growing body of basic research into the neural basis of predictions may have implications for certain clinical conditions that are beginning to be understood as an alteration of predictive processes. Schizophrenia and autism are being thought of in this way, at least in part – and some evidence suggests that these conditions are associated with differential patterns of oscillatory brain activity. More generally, predictions greatly shape our behavior and our conscious perception – so understanding how these predictions take place in the brain," Samaha concludes, "can hopefully inform theoretical advances as to how information processes takes place in neural systems." In short, researchers have discovered how we hit a curve ball.